Nigel Bradham could be getting paid soon. If the Philadelphia Eagles had any hope of re-signing free agent linebacker Nigel Bradham, they took a hit on Tuesday when the Kansas City Chiefs set the market high on linebackers by signing former Dallas Cowboys linebacker Anthony Hitchens to a lucrative deal. I'm not so sure Hitchens is a "big weapon," but whatever. If Hitchens' reported $9 million per year contract is any indication of what Bradham will fetch on the open market, the Eagles won't be able to afford him. 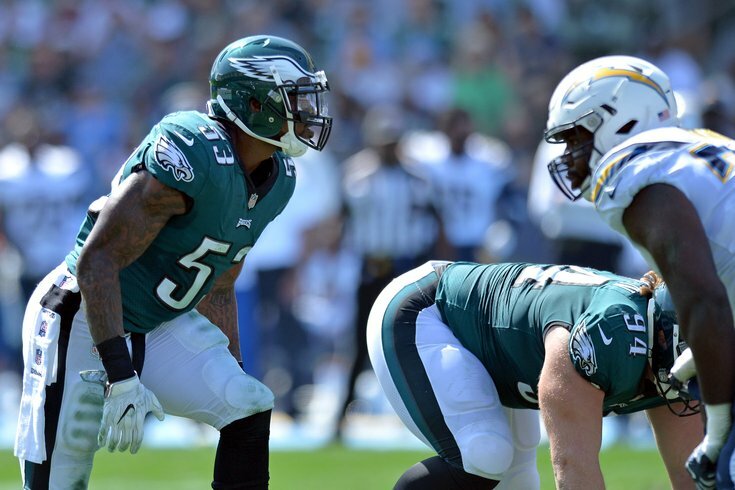 Should the Eagles lose Bradham in free agency, they will still have two good starters in place in Jordan Hicks and Mychal Kendricks, but their depth will take a significant hit. With Hicks and Kendricks both having a history of injuries, the Eagles are going to have to add a linebacker at some point, whether that be in the free agent bargain bin or in the 2018 NFL Draft. If the Broncos go hard after Kirk Cousins but come up short, that will signal that they don't believe there is a slam dunk quarterback that they can have at pick No. 5. So if not Cousins, why not Foles? The short answer, obviously, is that Foles will cost something close to the Broncos' 40th overall pick, and John Elway doesn't like giving those up. The Keenum deal would seemingly take the Broncos out of the equation for any potential trade for Foles. Report: Eagles restructure Lane Johnson's contract, free up significant cap space | Tom Brady admits he's haunted by Eagles' strip sack in Super Bowl LII | When (and how) the hell did Howie Roseman become a football genius? | The Q&A ... with Hall of Fame wide receiver (and Vegas showman) Terrell Owens | Should the Eagles pursue DT Ndamukong Suh?